Once upon a time there was a princess, a knight, and a dragon. Each one has a different part in a fairy tale and you get to bring it to life in the Fairy Tile board game by Iello. Who will complete their story book first? This post contains affiliate links which means we may earn a small commission if you make a purchase. I loved the concept of Fairy Tile from the moment I heard about it. I thought my daughter would enjoy it since she has an active imagination, loves writing stories, and is a voracious reader. We purchased it as part of our International Tabletop Day board game haul at our local board game store after she played an in-store demo. At the start of the game, you deal out all of the cards face down in a pile. Everyone will have the same number of cards whether you have 2, 3, or 4 players. You can only look at one card until you either complete it or choose to Turn the Page. Each card of the deck is a page from a story book. You are bringing each page of a fairy tale to life by acting it out on the game board. While the pages of the story remain the same, the land tiles keep each play through fresh. While the game is easy to understand and start playing, don't let that fool you into thinking it's easy to win! Getting the characters where you need them can be tricky and take several turns since each one moves differently. Plus, everyone moves the princess, knight, and dragon around. They do not belong to any one player. On your turn, you have three choices: move a figurine, add a land tile, or turn the page. 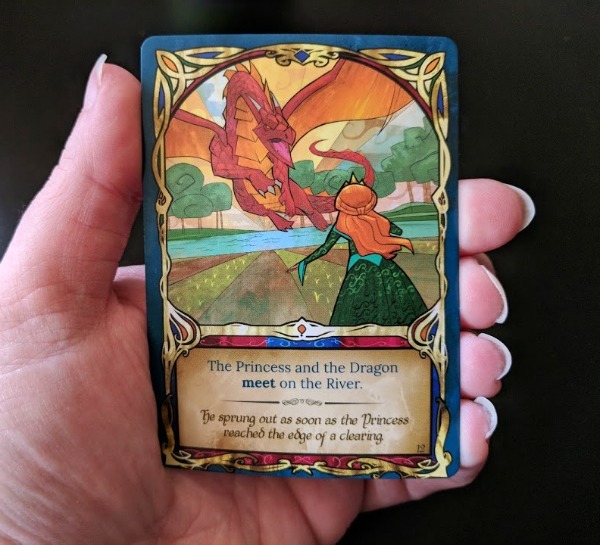 Your page cards will require the princess, knight, and dragon to move around in order to visit different parts of the land as well as encounter one another. There is some strategy involved to get everyone where they need to go! The princess can only move to one adjacent tile on each turn, but if she is on a castle, she can jump to another castle. The knight must move two spaces, but he cannot end his turn next to his original space. The dragon flies in a straight line to the edge of the land. He is the trickiest to land where needed! There are three starting tiles that will always be used at the start of the game. Land tiles have castles, mountains, forests, and plains. Some have a river running through them which requires careful placement. All of the land tiles are double sided, so be sure to flip some of them over as you shuffle them. This will help provide variations to the landscape each time you play. Every time you add a land tile, it alters the dragon's flight path since the dragon must land on the edge of town when flying. To create a large forest, mountain range, or plain, you'll need three of those landscape types to be connected. To create a large river, you need five connected river spaces. If it looks difficult to complete your current page objective, you can choose to Turn the Page. On your turn, you can place your page card underneath the rest of your card deck and look at the next page card. At this time you will flip over the magic token so the image is face up. At that point your turn ends; however, on your next turn you can complete a second action by using your magic token. It's like taking two turns in a row and sometimes that is exactly what you need to complete a page. When you use your magic token, flip it back over so the blank side is face up. You may choose to turn a page again on a future turn. If you completed the objective on your page card during your turn, then you recount the adventure by reading the snippet of story at the bottom of your card. Place the completed card face up in front of you and draw the next page card. The first person to complete all of their page cards wins. They put their pages in order (there are page numbers on the bottom corner) and read their story. 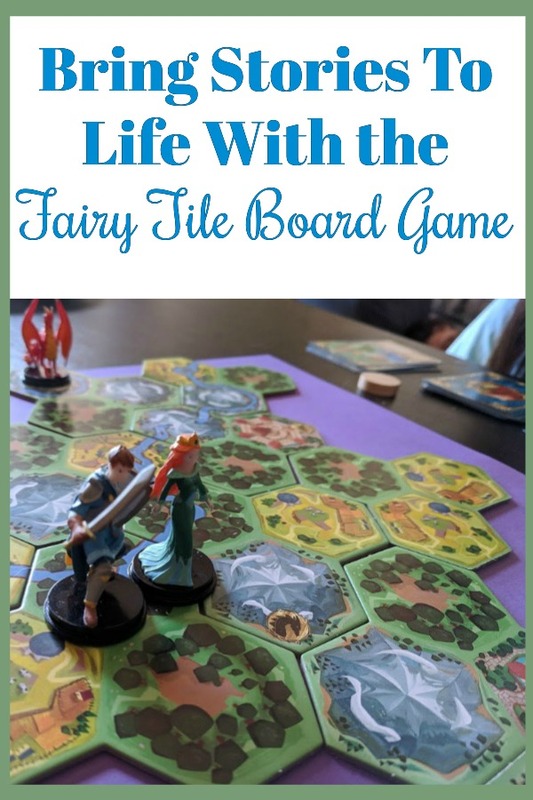 We've played the Fairy Tile board game as a two player game as well as a four player game. Although the recommended age is 8 years old, our 7 year old had no issues learning how to play. Our 5 year old played as well, but needed assistance reading his page cards. 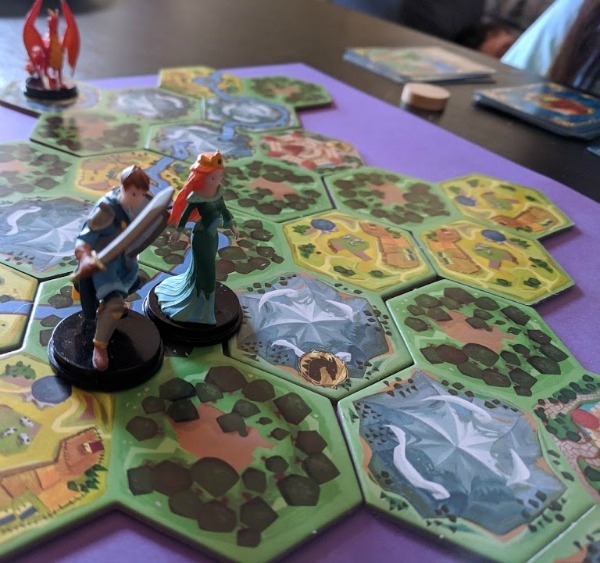 He quickly caught on to how the princess, knight, and dragon moved on the game board. Even though it is not a cooperative game, we did coach our children through their turns as needed by helping them determine potential moves for each character and answering questions they had about how to complete their objective. If you are playing more competitively, you wouldn't want anyone to know your page card objective or they may sabotage the careful character moves you're making. Since we were learning the game and assisting the kids as needed, it took more than 30 minutes to play. As with many games, the game play moves quicker the more familiar you are with the rules. I believe future play throughs will be closer to 30 minutes. 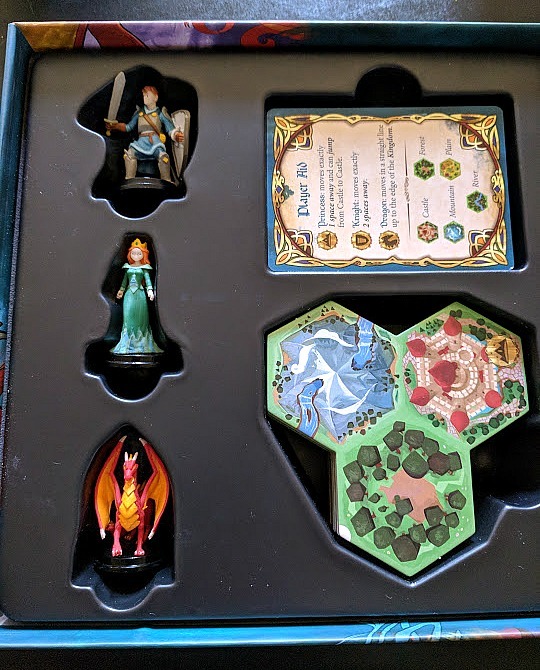 Fairy Tile contains good quality components and I think the page cards are beautiful. We started renaming characters in our stories and the page cards sparked our imaginations to elaborate on the story unfolding on the table before us. It's an excellent game for sneaking in reading time for the kids too. While it was enjoyable with 2 players, I preferred playing with 4 players. It made game play a little more interesting and moving the characters was a little more challenging because the page cards were divided among more people. I'd love to see an expansion pack of page cards to expand the fairy tale stories. Wouldn't it be fun to have multiple stories to play? 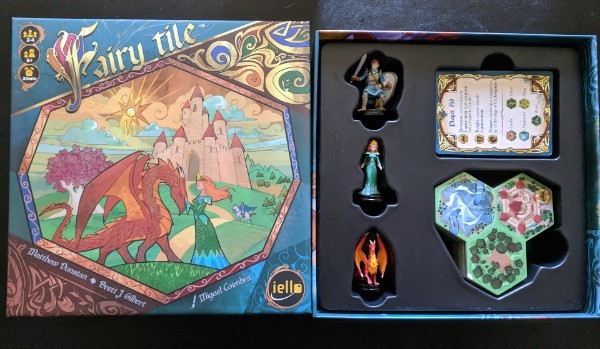 Find Fairy Tile at your local board game store, at the Iello official store, and on Amazon here.